Our Director of Visualization, Jared Foley, was invited to participate in Digital Portsmouth: The Art of 3D Modeling. The event, held at The Music Hall Loft in Portsmouth, New Hampshire, was part of an ongoing series about new media and emerging technologies. 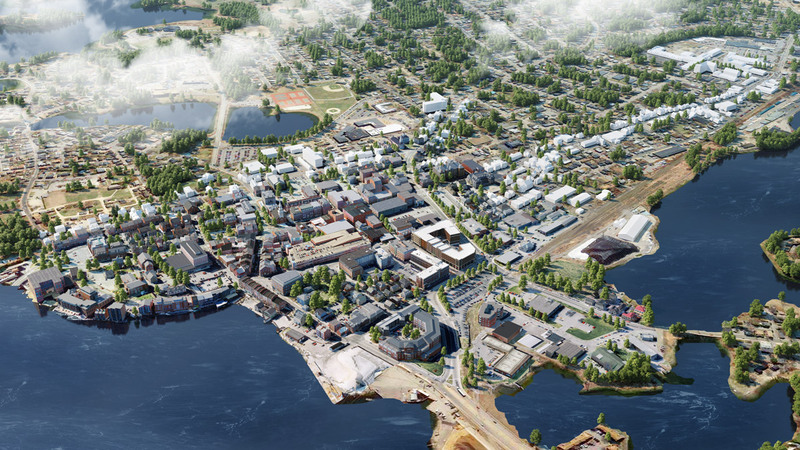 The focus of this segment of the Digital Portsmouth series was to show how 3D modeling is used in gaming, product design, and in how cities are planned. Jared was one of three guests speaking on the subject, each in their own field of expertise. Modeling is still the core of what Tangram 3DS does. Jared went into great detail explaining how yet-to-be-built environments are created, as well as the flexibility one has when working with architecture in 3D. The office helped to put together an excellent presentation for Jared to use as he spoke. The short videos and renderings of work samples helped to explain the different aspects of 3D modeling. Tangram 3DS has worked on several projects over the years in Portsmouth, as well as the large-scale 3D model of the City of Portsmouth. These proved to be excellent examples in describing the process and benefits with projects that resonated directly with the audience. The event was successful and fun; Jared enjoyed seeing how 3D modeling is used in other capacities, as well. We are honored that Jared was able to represent Tangram 3DS; and we look forward to more events like this in the future.